Hostal Bakano Backpackers i Bogota, Colombia : Boka nu! 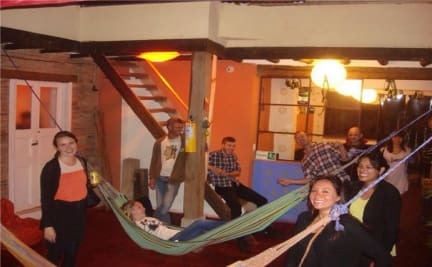 Hostal Bakano Backpackers is located in the historic neighborhood of La Candelaria in downtown. It is in a strategic position to know the best places in town. The historic district is the best choice! The brand new hostel in its facilities include: a large patio, terrace, TV room, fireplace, kitchen, laundry, lockers, communal computers, WiFi, bathrooms for men and women separately fully equipped, hot showers (6), breakfast included, luggage storage. Nice common areas, well located, clean & safe! you will enjoy!